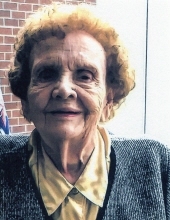 Arlene Joy Homervold, 94, of Story City died March 24, 2019 at Bethany Manor in Story City. Arlene was born on April 10, 1924 in Story City, Iowa to Austin and Carrie (Dueland) Charlson. She married Arthur Homervold in 1942 in Belmond, Iowa. They farmed in near Belmond for many years and Arlene later ran Arlene’s Knitwear Fabric for several years and also conducted sewing lessons. Arlene was a founding member of First Lutheran Church in Clarion and volunteered her time and talents in many activities. She was also active with Wright County 4-H and directed the county choir. Arlene had the privilege of visiting Norway in 2006 to see where her family came from. She kept active for many years in both the Clarion and Belmond communities volunteering whenever she was needed. Arlene is survived by her daughter, A. Faye Heykants of Ankeny; three grandchildren, Mark (Nikki) Heinzig of St. Paul, MN, Krista Heinzig (Jody Ansems) of London, England and Kara Heinzig of Ankeny; a great grandson, Peter Heinzig of St. Paul, MN; Bill Heinzig of Ankeny and nieces and nephews. She was preceded in death by her parents; her husband, Arthur and a brother, Alvin Charlson. To send flowers or a remembrance gift to the family of Arlene Joy Homervold, please visit our Tribute Store. "Email Address" would like to share the life celebration of Arlene Joy Homervold. Click on the "link" to go to share a favorite memory or leave a condolence message for the family.